Most people enjoy eating breakfast for dinner but don't usually think about it because they're stuck in a rut with the same old dinners every night. Mixing up what you eat for dinner can really be fun, even if for no other reason than it's something different. Breakfast provides so many quick and easy dinner opportunities such as omelets, pancakes, waffles, frittatas, stuffed french toast, quiche, eggs benedict, or even breakfast pizza. I've never been a big breakfast food person but I've always loved french toast. Whenever I go out to eat for breakfast the odds are good that I will order some variety of french toast, usually stuffed because I love the filling that is typically cream cheese and topped with fruit. 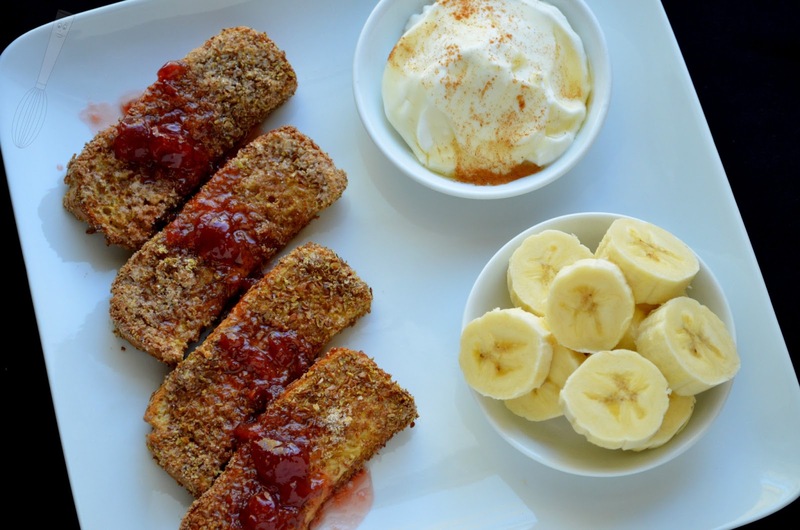 I'm sure that a fresh homemade strawberry sauce would be amazing on these french toast sticks, but a jar of strawberry jam is a good stand in for a quick meal. This recipe uses ground flax seed and it's important that its ground for two reasons. The first is that nobody wants to try to roll these sticks in whole seeds, it just wouldn't coat them well enough. The second is that the body actually benefits more from ground flax seeds because they are digested easier than whole seeds which I've heard don't digest well and simply go through the system. Flax seeds are so healthy for the body, have lots of nutritional benefits, and they keep in the refrigerator or freezer for a long time so you don't need to worry about them going bad. For most kids this would be a great recipe because they would probably enjoy the crispy outside and the dippable sticks. They could dip them in maple syrup or a little cup of the strawberry sauce. I served these with plain greek yogurt topped with a little honey and cinnamon, and fresh bananas as you can see in the pictures. I loved the combination and the meal was really filling. Happy baking! 1. Preheat the oven to 450F. Set a cooling rack on a baking sheet and set aside. In a small bowl, combine the flax seeds, 3 tablespoons granulated sugar, and cinnamon, then set aside. 2. In another small bowl, combine the whole egg and egg white, whisk them together a little, then add the milk, remaining sugar, and vanilla. 3. 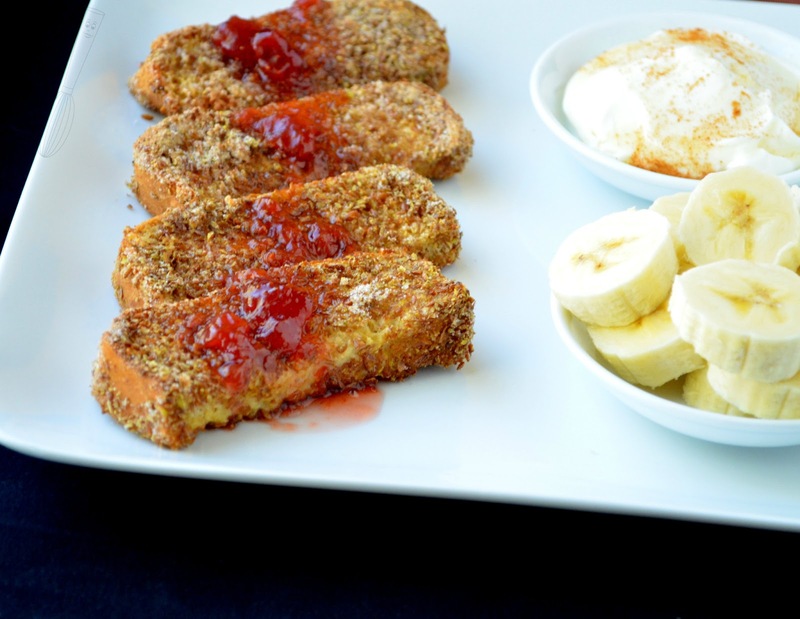 Cut each slice of bread into three strips, dip each in the egg mixture, then in the flax seed mixture. Place the sticks onto the cooling rack on the baking sheet. Bake for 10-12 minutes or until golden brown and crispy on the outside. 4. 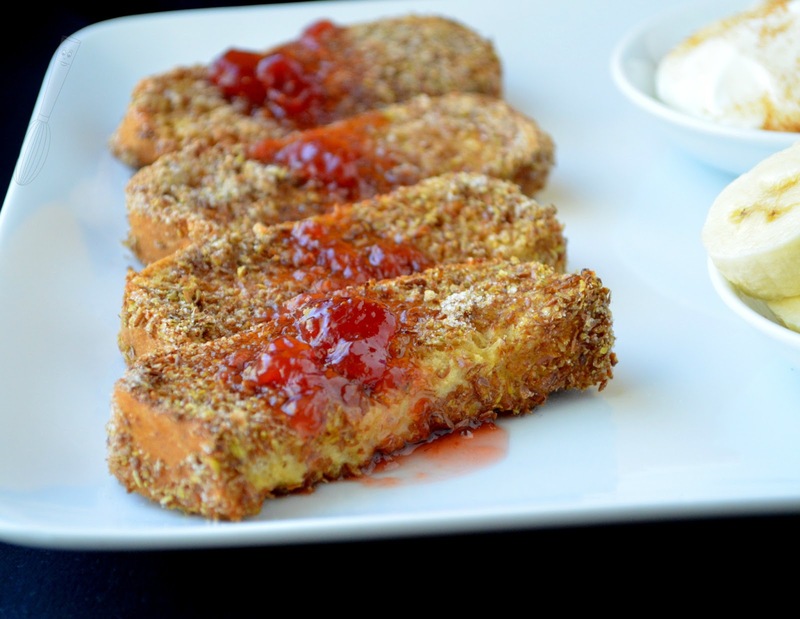 While the french toast sticks are baking, heat the strawberry jam and water in a small saucepan. Bring to a simmer and let cook for 3-4 minutes or until thickened slightly. 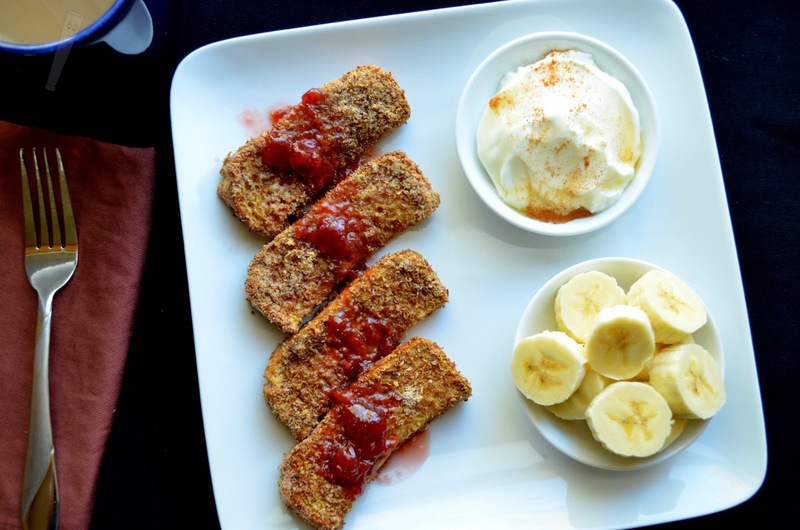 Spoon the sauce over the french toast sticks.